The first Salsa Contest was held at the Collingswood Farmers' Market took place, this past Saturday, July 9th, and it was a hot hit. There were over 20 entries of salsas, with categories ranging from Traditional Red, Fruit, Verde, Salsa Cruda (Uncooked), and Freelance Vegetable. I was invited to be one of the judges, among the group of Collingswood Farmers' Market "bloggers". Eight of us were in attendance as judges, including Collingswood Restaurant, TheTortilla Press Chef/Owner, Mark Smith, as well as Christine Clarke (The Coveted Kitchen); Natalie Winch, (Food Empowerment TRADSNTFADS.com); Donna Hutchinson, (My Tasty Journey); Susan Lynch‘s daughter (Yellow Room Upstairs); and Alan Fishman, Longtime Friend of the Farmers’ Market. Also joining us to sample/judge and declare a winner, was Ryan Harrison, owner of Preservation Gourmet Foodery, from just up the road in Westmont, NJ. All of us got our chips ready and eagerly scooped into the salsas. Winners in each category were awarded Collingswood Farmers' Market cash, ribbons for their placements, and the grand prize winner won a hand-crafted, one-of-a-kind skateboard made and donated by Collingswood Board Co., appropriately named, The Salsa Board! This skateboard, made by Lee Ballauer and Erin O'Donnell, was a most coveted prize. We had several "skate-punks" enter the contest, eager to win this board. It was a tough competition in some categories, the salsa cruda and the fruit salsa categories were the most popular, having more than five entries in each. For the salsa cruda I was very taken with Jersey Gina's "Spechie Freshie Salsa", one that reminded me of a Texas "Caviar", which was a multi-bean salsa with diced vegetables and tomatoes. Another bean and vegetable salsa won third place, created by James Smith. He called it his Summer Sweet Salsa. He and his wife both took home ribbons for winning entries! There were several family team entries, including team relatives Debbie and Nick, who each submitted their salsas in different categories. Nick's was a fiery red Traditional Red, and Debbie's, Saucy Muffin Salsa, was a Salsa Cruda that incorporated capers and kalamata olives, making it a unique mediterranean sauce. Another mother and son duo, Karianne and Luke Lindner, entered a peach salsa, called, "The Babe Salsa", into the fruit salsa category. Even judge Ryan Harrison's mother, Gina Harrison, got into the mix - entering her salsa on the down-low. Son Ryan had no idea his mother was a participant - making sure there was no nepotism! with his mother, who unbeknownst to him, entered into the contest! Other younger contestants were impressive with their offerings as well as their cooking skills. Outstanding in the fruit category was Cody W's, Monroeville Mango Salsa, made original by his use of a splash of balsamic vinegar to add a sweet and tangy note to his salsa. He took first place in the fruit category and 2nd over-all in the grand prize judging. Cody is a Farmers' Market long-time vendor family. Many Friends of the Market have watched Cody grow up over the years. Lindsay, Coley with son, Caesar, and Cody. One of my favorites for the fruit salsa was my friend, Coley's, salsa, a strawberry and avocado salsa that was tangy, sweet, unctuous and for me, addictive. It was the kind of salsa that would be one of those ever-evolving creations all spring, summer and fall, changing with the seasons as fruit comes in and out of ripeness. Coley's salsa took third place in the fruit category. I didn't know she had entered the contest - which was a good thing, I wasn't making a biased choice when I voted her salsa as my over-all favorite! Most of the judges took their time, shoveling, um, I mean thoroughly enjoying all the entries multiple times so that I could be sure of the ones we enjoyed best! Some salsas were clear winners to me, while others were so nuanced that I had to re-taste to discover new sensations. I took copious notes, and I think I was the last judge to submit my votes. In the end, while we had strong opinions and divergent ideas on who should take the category prizes; our votes were tallied and the winners were announced. Some clear winners, some as no surprise, and others were called in a tie-breaking run-off. We had to have two run-off votes! All the judges were tied again, so we split the salsa cruda contest first place entry between two offerings splitting the prize. The Fruit Salsa offerings also had a tie for first place, but Cody's Monroeville Mango Salsa won in the tie-breaker, leaving Lindsay's pineapple salsa to take 2nd place. When we got to the grand prize judging, the winner was clear, Sunshine Urbiniak's, Salsa Verde entry was deemed the best. Gorgeous to look at, piquant, tangy, and mildly spicy, this green salsa tinged with tomatillos, cilantro and red onions was the forerunner of all the entries from all categories. Lindsay T's - Pinacasalsa - tied for 1st (I loved her presentation, putting the salsa into a pineapple "boat" for serving! Bonus points for that Lindsay! Freelance Vegetable - only one entry! Getting to be a judge for the first ever-salsa contest was a lot of fun. I could see how this is a coveted job. With the season of fruits and vegetables beginning to hit the peak of freshness, I am looking forward to making and preserving a lot of salsas, as well as my other canned specialties. I'm also hoping that I'll get to be judge in the upcoming Peach Pie contest that will take place at the Collingswood Farmer's Market later this month. As for next year may there be double the amount of participants in the salsa contest. It'll be fun to see how many of our younger contestants evolve and grow their culinary skills. Great job to everyone. 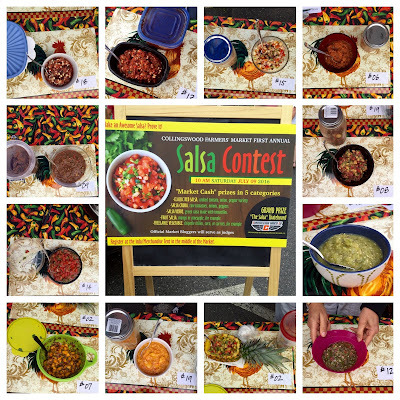 Also go to see photos by Tricia Burrough, of the Collingswood Friends of the Farmers' Market Facebook page https://www.facebook.com/collsfofm/ Tricia has gorgeous shots of the salsas, the contestants, of course, the judges!